A teenager chose to stay home day after day in her pyjamas rather than go to school a court was told. Samantha Preston, 34, of Norbreck Road, Blackpool, pleaded guilty to failing to ensure a child’s regular attendance at school. 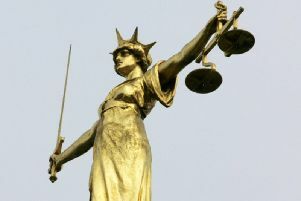 She was fined £120 and ordered to pay £30 victims’ surcharge by Blackpool magistrates. Nicola Morgan, prosecuting for Blackpool Council’s Education Department, said the case concerned a 15-year-old girl who was a pupil at Montgomery High School. The girl’s attendance rate at lessons was 7.53 percent between December 4 last year and May 21 this year. On one occasion the school’s pupil welfare officer visited the girl’s home at 2pm and found she was in her pyjamas. The girl was said to stay at home day after day in her pyjamas. Preston told magistrates that the girl had mental health issues and she believed she was depressed.She was frightened of pushing her to go into school in case that made her issues worse. A man who assaulted his mother breached a court order punishing him for the offence on six occasions. Wayne Walton, 41, of Lytham Road, South Shore, was found guilty of failing to comply with a suspended prison sentence after a trial in his absence. An extra 25 hours unpaid work for the community was added to Walton’s sentence and he was ordered to pay £50 costs. Cheryl Crawford, prosecuting for the probation service said that Walton had originally been sentenced to a community order with unpaid work for the community for an assault on his mother. Walton had breached that community order four times and his sentence was upped to eight weeks imprisonment suspended for 12 months with 146 hours payback work. He then breached the suspended prison sentence. After this Walton had again failed to attend to do payback work – on April 17 and May 8. He still had 26 hours unpaid work to complete. Suzanne Mugford, defending, said her client had been his mother’s carer but she had forgiven him after he assaulted her. He had moved back to her home and prioritised caring for her over doing his payback work. The defence added that Walton had attended the unpaid work session on April 17 but did not have the documentation to prove it. On May 8 he had been ill and sent in a sick note to the probation service but this evidence arrived two days later than the time limit allowed. A defendant was unable to attend a court hearing because he had a family medical emergency, a court was told. Andrew Perks, 47, of Dickson Road, Blackpool, had a plea of guilty to failing to comply with the conditions of a community order entered on his behalf by his defence lawyer. He was sentenced to serve an extra seven hours unpaid work for the community and ordered to pay £100 costs. The prosecutor said Perks had been sentenced to a community order for driving while unfit. He breached the order by failing to turn up for appointments with his probation officer on May 26 and June 6. Robert Castle, defending, said Perks had telephoned him that morning to say his 72-year-old mother had been taken to the Birmingham Royal Hospital after a possible seizure and that Perks and his brother had been advised they should get there as soon as possible. A mother has been fined in her absence by a court for not regularly sending two children to school. Lisa Walker, 32, of Devonshire Road, Blackpool, who did not attend court had previously pleaded guilty to two offences of failing to ensure a child’s regular attendance at lessons. She was fined £180 with £40 costs and ordered to pay £30 victims’ surcharge. Lynda Bennett, prosecuting for Blackpool Council’s Education Department, said the case concerned the attendance at the resort’s St Bernadette’s Primary School of a nine-year-old boy and girl aged 10 between October 2 last year and June 22 this year. The boy’s attendance was 86.33 per cent with 41 unauthorised absences and the girl’s attendance was 88.3 per cent with 35 unauthorised absences. The prosecutor said the pupil welfare officer had taken numerous steps to encourage Walker to send the children to school regularly, sending her five letters and having a meeting with her to express her concern.